The dechlorination reaction rate is often expressed and measured as the chlorine half length value. The chlorine half length represents the granular activated carbon bed depth required to reduce the chlorine concentration by 50% under the defined test conditions. Different methods are used to evaluate the dechlorination performance of activated carbon at the laboratory scale. These methods differ in flow rate and bed size, e.g. DIN 19603 a 50 cm3 bed at 5 ppm free Cl2 or the proposed ASTM conditions of 25 cm3 and 30 ppm free Cl2, but both give carbon bed depth values needed to reduce the chlorine concentration in the water by a half (Chlorine Halving Bed Depth) at a linear velocity of 3.6m/h (360cm/h; 6cm/min). 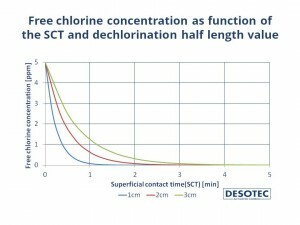 The graph above visualises the impact of the dechlorination half length on the free chlorine concentration as function of the superficial contact time (SCT). The shorter the dechlorination half length, the faster the free chlorine breakdown reaction is.